The Gyro Shot is an Offensive Power Shot in Mario Tennis: Power Tour. Sheri uses this Power Shot in the story mode. It can be unlocked for Clay and Ace to use by gaining L5 Spin and L2 Balance. 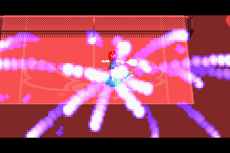 When activated, the user will spin in a purple mass of energy, then hits a Lob Shot. The receiver, if able to return the shot, will spin uncontrollably for a brief period of time. "A speedy lob shot that spins fiercely, like a top." This page was last edited on May 2, 2017, at 19:17.